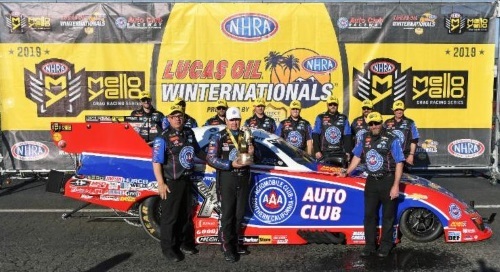 POMONA, Calif. (February 11, 2019) — Robert Hight and the Automobile Club of Southern California team raced way to their victory at a weather delayed Lucas Oil NHRA Winternationals, the opening event of the NHRA Mello Yello Drag Racing Series season. 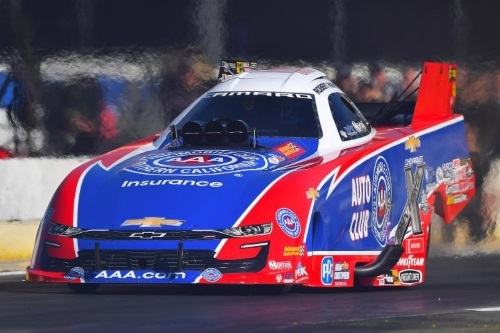 On the way to their fourth win, Hight, the John Force Racing president, handed team owner John Force a loss in the semifinals and watched Top Fuel teammates Brittany Force and Austin Prock face-off in a first round duel that earned Prock the first-round win of his career. Consistency for Hight began against long-time rival Bob Tasca III. Hight managed an impressive 3.856-second pass at 331.61 mph to outrun Tasca’s 3.932 at 322.58. The second-round win paired him against John Force Racing owner, CEO and Hight’s mentor, John Force in the semifinals. Despite an impressive race day set up for the 16-time champion, Force’s 3.930-second pass at 321.42 mph wasn’t enough to stop Hight. The Auto Club Camaro had another stealth run at 3.830-seconds and 328.22 mph. In the finals it was another classic matchup between NHRA standout teams, John Force Racing and Don Schumacher Racing with Jack Beckman in the right lane against Hight and the Auto Club Chevy. It was a crowd pleasing drag race as the hot rods were neck and neck. 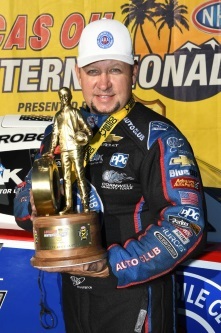 Hight picked up the victory on a hole shot with his .054 reaction time and 3.881-second pass at 329.75 mph. Beckman was .062 on the light with a 3.880 pass and 329.42 mph. “To come out here and be No. 1 qualifier and win the race, it’s quite an accomplishment for this team. Jimmy is really happy with the way this thing runs. How easy it is on parts. I’ve never seen him more confident,” Hight said who leaves Pomona with the Mello Yello points lead. “We ran in here after testing well in Phoenix and didn’t miss a beat so it was awesome. It was a great day. John Force and the PEAK Coolant and Motor Oil Chevy Camaro SS currently sit fourth in the points standings following Sunday’s semifinals loss against fellow teammate Robert Hight. 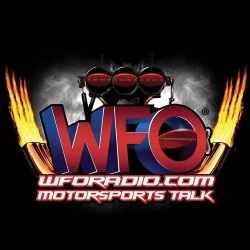 With what was a strong pass by both drivers, Force fell short after beating Hight at the tree with a .059 reaction time to his .068, and ran a 3.930 compared to his 3.883. Although he didn’t achieve his 150th NHRA victory just yet, Force had an impressive first round win against Matt Hagan where he recorded the top speed of the event at 333.74 mph paired with a 3.890-second ET. 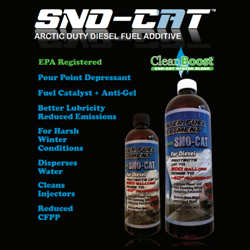 In the second round he came face-to-face with Ron Capps where he ran a 3.900-second pass at 323.19 mph to Capp’s 4.092-second pass at 248.07 mph. 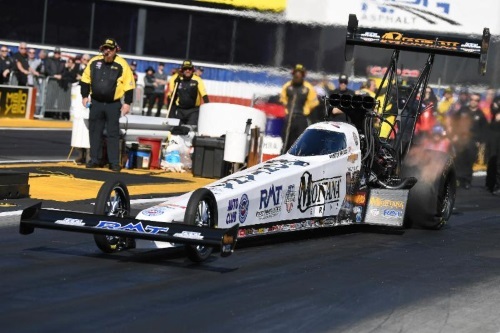 Before the weather interfered with Sunday’s racing activity, six pairs of Top Fuel dragsters lined-up, including Austin Prock in his Montana Brand / Rocky Mountain Twist dragster against Brittany Force in her Advance Auto Parts dragster. It was a pedal fest for the John Force Racing teammates with Prock getting the better of the track. Prock would cross the finish line with a 4.029-second pass at 312.21 mph to record his first professional NHRA career round win. 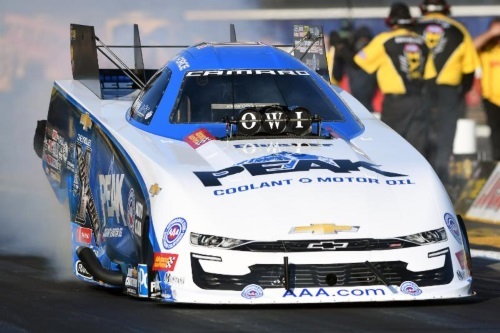 In the second round that commenced on Monday morning, Prock had a stellar 3.699-second pass at 334.15 mph but was narrowly defeated by Mike Salinas and his 3.685-seocnd pass at 334.40 mph. After a good showing through qualifying where she landed fourth, Brittany Force found herself going head-to-head with teammate Austin Prock on Sunday. 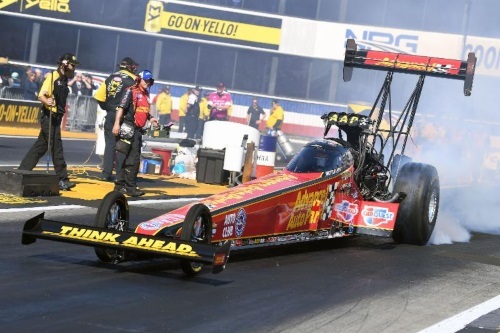 Force pedaled her Advance Auto Parts dragster to a 5.851-second pass at 112.72. With her new team and new set up, the 2017 Top Fuel world champion is focused on the progress they’ve made and looking forward to the next event in Phoenix. The NHRA Mello Yello Dra Racing Series season continues at Wild Horse Pass Motorsports Park with the Magic Dry Organic Absorbent NHRA Arizona Nationals Feb. 22-24.